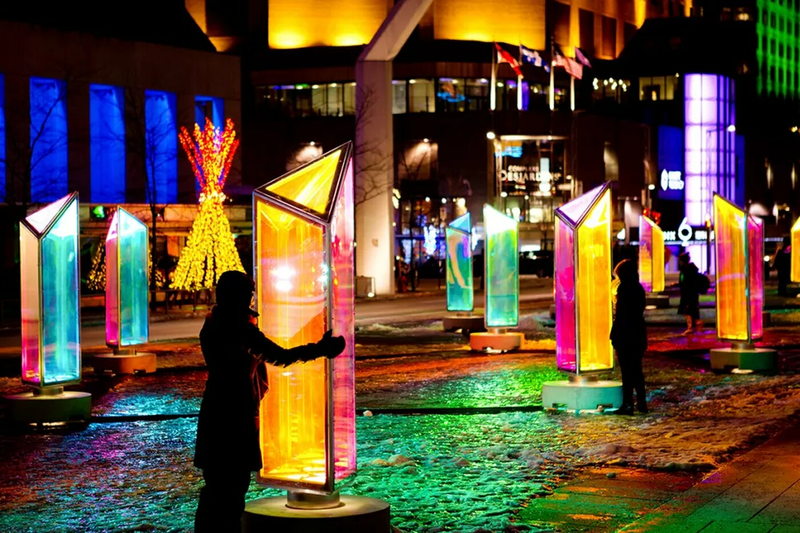 A creation by Raw Design, Prismatica will bring its colorful, spinning, sound-making prisms to the new Cherry Street Pier as part of the Festival of the People. Spend a day this weekend at the Delaware River waterfront's newest attraction, Cherry Street Pier (opening on Friday), and you'll find plenty to do. The venue is set to host its first event, the Festival for the People, which will fill the former shipping pier with art installations, video screenings, and a three-weekend calendar of events. Art will be on exhibit at neighboring Race Street Pier, too. Starting Saturday, Oct. 13 (through Oct. 28), you can a ride a seesaw that lights up and makes music as you move, spin a massive prism to create electronic sounds, view artsy crafts, write a poem using an old-school typewriter, and more. The free festival is the work of Philadelphia Contemporary, an edgy new museum without walls that's become a force in Philadelphia's arts community, in partnership with the Delaware River Waterfront Corp.
Philadelphia Contemporary created the fest not only to highlight the new Cherry Street Pier but to also to celebrate art from various subcultures, including comics, tattoos, and the internet. They also wanted to "reimagine the civic … and find a sense of community even among our differences," says Nato Thompson, artistic director of Philadelphia Contemporary. "A lot of the content, especially in the video installations, will touch on topics like feminism, xenophobia, democracy in the Middle East, and other issues designed to start a conversation and elicit quiet reflection," Thompson said, "but in the friendly and playful atmosphere of a festival." The Cherry Street Pier on the Delaware waterfront reopens Friday as an artsy gathering spot. The Festival of the People (Saturday through Oct. 28) kicks things off. Art installations will be on view daily, but all festival events will take place Saturdays and Sundays. Each of the three weekends has a theme. "Analog culture" is the theme for the first weekend (Oct. 13 and 14), which will include an origami workshop, a screen printing demo, and art-making stations. There will also be a panel discussion with participants including Emory Douglas, minister of culture for the Black Panther Party and designer of the movement's newspaper, The Black Panther. Comics, artist zines, vinyl records, and other printed materials will be on display. The next weekend's theme, "embodied culture" (Oct. 20 and 21) will focus on body art and dance. Female and gender-nonconforming tattoo artists will give tattoos Saturday afternoon and evening. Tattoos will be priced at the discretion of the artist. (Henna and temporary tattoos will also be available, and free.) On Sunday, First Person Arts will curate a story slam, kicking off at 5 p.m. Other attractions include a yoga and poetry class, African drumming and dancing, tango, Lindy Hop, and a blues session. The "Oddly Satisfying Film Festival" will take over the final weekend (Oct. 27 and 28), featuring video submissions by local teenagers and meant to highlight the popularity of YouTube culture. The festival is currently accepting submissions from youths ages 12-18 in and around Philadelphia. An awards ceremony Saturday, Oct. 27, will feature appearances by YouTube celebrities Bread Face, Glitter Slimes, and Lily Whispers ASMR. All events are free and open to the public. Details are at philadelphiacontemporary.org/festival-for-the-people.